Programmers, rather than users (and purchasers of computer systems), are the beneficiaries of improvements in computer architecture. Faster CPUs allow programmers to write sloppier code while still maintaining the performances levels acceptable on previous generation CPUs. Programmers who don't have to work at writing great code, never learn how to write great code (or if they originally knew, their skills atrophy from disuse). A huge problem today is that many programmers have grown up with high-performance machines and have never learned how to write decent code in the first place. Unfortunately, advances in computer architecture are no longer doubling CPU performance every couple of years as they have in the past. Therefore, today's programmers can no longer get away with writing slow code and expecting advances in computer architecture to rescue them a few years hence. The Write Great Code series is intended to help rectify this problem by teaching the forgotten art of crafting well-designed, efficient, software. Today's programmers are often narrowly trained because the industry moves too fast. That's where this new series from Randall Hyde (author of The Art of Assembly Language) comes in. This, the first of four volumes, teaches important concepts of machine organization in a language-independent fashion, giving programmers what they need to know to write great code in any language, without the usual overhead of learning assembly language to master this topic. The Write Great Code series will help programmers make wiser choices with respect to programming statements and data types when writing software. If you want to write the fastest, most efficient, code, then you have to write your applications in assembly language. Claims that modern compilers produce code that is just as good as hand-written assembly language rarely stand up. In practice, the way most programmers write their high-level language code often results in low-quality machine code output from a compiler. Unfortunately, coding applications in assembly language is rarely an option for a variety of practical reasons (including the fact that few programmers know assembly language). So a good question to ask might be "Is there some way to write high-level language code to help the compiler produce high-quality machine code?" The answer to this question is "yes" and Write Great Code, Volume II, will teach you how to write such high-level code. 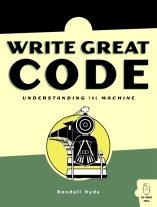 This volume in the Write Great Code series describes how compilers translate statements into machine code so that you can choose appropriate high-level programming language statements to produce executable code that is almost as good as hand-optimized assembly code. Chapter Eight is available as a sample on-line chapter, and you'll also find the links to On-line Appendix A and On-Line Appendix B, below. Chapter 2: Shouldn't You Learn Assembly Language? Currently Being Edited at No Starch! Great code has several attributes. Books I & II of the Write Great Code series address an important attribute, efficiency, that is often ignored in modern software development. However, although inefficient programs are never great, efficiency, by itself, does not guarantee greatness. 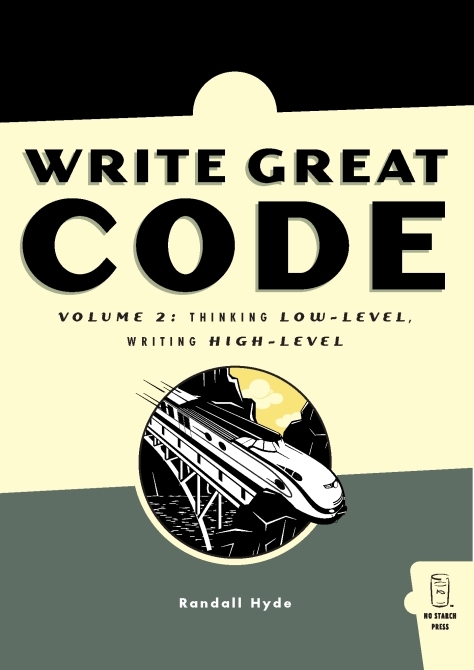 Book III of the Write Great Code series discusses software development methodologies, developer metaphors, ethics, productivity, and system documentation. Great code begins with a great design. Book 4 of the Write Great Code series concentrates on analysis and design. This book covers traditional structured design as well as object-oriented analysis and design (as well as design patterns). Great code has several attributes. A great design is the starting point, but great code must also adhere to good coding standards and be readable and easy to maintain. The fifth volume in the Write Great Code series addresses the issues of creating readable and maintainable code that will generate awe from fellow programmers. Great code works. This fourth volume in the Write Great Code series will discuss how programmers can ensure their applications have the high quality they require to be truly great applications.